So we've arrived at the long-awaited Avengers: Time Runs Out event, the final step before the new Secret Wars begin. I've decided to review the first two hardcovers of Time Runs Out since the first trade is almost entirely set-up. Hickman is writing this to all be read in one sitting, so there's simply a collection for every five issues; while the first collection ends abruptly, the second has some good cliffhangers to serve as a midway mark. Due to the eight-month time jump since the Infinite Avengers trade, the first issue of Time Runs Out would technically be coming out a week or two from today. Marvel's done an admirable job building up to and alongside Avengers and New Avengers. Certain plot points from recent crossovers, including Steve Rogers remaining old, Tony Stark remaining inverted, and the Invisible Woman being a S.H.I.E.L.D. agent, were first revealed in Time Runs Out. The only major contradiction I've found is that Spider-Woman is still in her old costume, but that occurred because the costume switch in her own title was seemingly moved up. Many previous plot points come back into focus: Thor regains some of his old power using the "unworthy" Mjolnir of Thorr, while the Illuminati hide out in a setting from Hickman's Shield. Even Doctor Doom's desire to become more story than man in Loki, Agent of Asgard: I Cannot Tell a Lie gets mentioned and reinforced. There's a massive amount of characters involved in Time Runs Out; every issue has an ever-growing cast diagram. From the ending of the Infinite Avengers collection, the Illuminati have gone on the run after being exposed by Captain America. Namor has joined a new Cabal to complete the ruthless eliminations of other Earths that the Illuminati refuse to accomplish; this group includes Maximus the Mad, Terrax (now Truly Enlightened), and Thanos and his Black Order. Doctor Doom refuses to join this group due to his own plans involving Molecule Man, the Mad Thinker, and Valeria Richards. The Illuminati themselves have added new members like Hank Pym, Amadeus Cho, and an impressively eye-patched Captain Britain. The aged Steve Rogers becomes the director of S.H.I.E.L.D. and causes the main Avengers team to disintegrate with his order to hunt the Illuminati. Some, including Maria Hill, Sam Wilson's Captain America, Invisible Woman, Hawkeye, War Machine, and Captain Marvel work for him. Many of the newer members organize behind Sunspot and Hyperion; the former buys out AIM while the latter guides his Zebra Kids towards building a device to let them traverse the multiverse more easily. There's one final team of Avengers that plays a part in the second hardcover. They are sadly spoiled by the back of the trade, so if you get this in physical form versus digital, don't look at the back if you want to be surprised (and you should). There's an interesting retcon that happened right under my nose: Smasher is no longer the implied granddaughter of British sci-fi hero Dan Dare. Instead, she's Isabel Kane, granddaughter of the World War II hero Captain Terror. As I understand it, this was due to rights issues, but this actually benefits the character since Captain Terror knew and worked with Captain America, lending credence to Kane getting his granddaughter into the Avengers. Plus they can add Smasher to the Invaders if they want to try another relaunch. The whole Sunspot/Cannonball/Smasher plotline has been a core focus of the Avengers World title -- fittingly so since one of Hickman's very first Marvel assignments was a New Mutants story. The artwork for the two titles is handled rather interestingly. Valerio Schiti draws the first New Avengers issue before Kev Walker takes over. But the Avengers issues have multiple artists and some illustrate specific plotlines, such as Mike Deodato drawing the S.H.I.E.L.D.-related scenes and Stefano Caselli handling most of the work with Sunspot's "New" Avengers. I can understand why they used this method: not only does it add some visual flair, but it also allows them to switch artists in and out in case deadlines cause problems. As much as I enjoyed Time Runs Out, the hardcovers cost way too much -- $25 for five issues. There will likely be an omnibus of the entire storyline announced in the fall if you're willing to wait. Letting Avengers and New Avengers books jump eight months into the future allowed Hickman to skip Axis entirely and reduce the number of things he'd have to retcon away later. Without the skip, it would have taken almost an extra year from now until the start of Secret Wars. 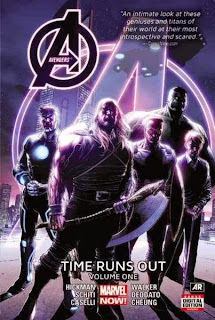 Avengers: Time Runs Out ends today, the Wednesday of what I like to call "Avengers Week." Tuesday saw an Agents of SHIELD episode that ties into Avengers: Age of Ultron, which comes out tomorrow and which I will most definitely be in line for. To top it all off, Saturday is Free Comic Book Day, allowing Marvel to pick up some of the synergy from the film and apply it to the comics. Speaking of Ultron, next week it's time to take a look at one of the comics that directly inspired the blockbuster: the classic Ultron Unlimited.